The Walking Dead executive producer Gale Anne Hurd recently had the chance to speak at a Masterclass at the Edinburgh International TV Festival about the upcoming season of the anticipated AMC show returning this fall. 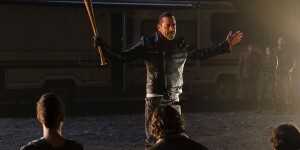 Of course, everyone wants to know about the new big bad Negan. She had a few choice words about him, his arrival, not dragging anything out longer than it needs to be, and what it means for the show going forward. Sound like it was a good choice to go with AMC who helped adapt the show to mirror the comic book closely. Hurd also commented that even though the show has zombies in it, the show is much more about the humans and how they have to deal with a new world. Hurd was also joined at the festival by actor Michael Cudlitz (Abraham Ford) who also was very excited about the show going forward. He got to speak about the intense season six finale and Negan’s arrival. When discussing Jeffrey Dean Morgan joining the show as Negan he was commenting on him just hitting the ground running. Cudlitz also commented on the grueling process of filming that memorable scene as well as the season premiere which picks right up from the season finale. The actors have to commit to filming eight hours a day on their knees and be in constant peril of this new bad guy, as well as the knowledge that one of them wasn’t going to be on the show for long. Cudlitz who joined the show in 2010 is now considered a veteran on the show reflected on him joining the show as well. He was initially sent the pilot script and was immediately hooked on the show. He also loves the fan reaction to the AMC show and compared his love for being on the show to the love of a child referencing one time he was introduced to fans at the New York Comic-Con in 2013. The Walking Dead returns to AMC October 23, 2016.